Shutters, blinds, and other window treatment affect the look and feel of your home, but they can also affect your monthly utility bills. The right window treatment can make a big difference during the winter months to keep your energy bills from skyrocketing when there is a chill in the air. The perfect window treatment is one that looks beautiful, and provides significant benefits to your home. Stanfield Shutters are designed to do exactly that. Shutters from Stanfield are designed to provide a custom look that are excellent sealants, insulators, and barriers, which reduces your monthly energy bills. Interior shutters are quite possibly the best possible window insulation system because they are actually fastened to the window jam itself, which seals off the window, keeps heat in, and keeps the cold out. When installed correctly and tightly against a window frame, solid shutters provide an additional layer of insulation all year-round. Wood itself is an excellent insulator. A window covered with wood blinds is better than fabric drapes, but a shutter provides the best insulation possible. The shutters themselves are created from a material that is thicker than a wood blind, which makes them more efficient than other window covering options. This provides energy efficiency in both cold and hot months. In the summer, this additional insulation provides more efficient shade inside the home, which reduces the costs of air conditioning. When you install shutters, there is space between the shutter and the window. This air is constantly moving but the structure of a shutter creates a barrier that makes it harder for hot air to escape out and cold air to get in. The longer you can hold heat inside, the less heat you use to keep the home at a comfortable temperature, saving you money during cold winter months. Our shutters are designed to keep out both the summer heat and the winter chill so your home maintains a comfortable temperature all year round. Shutters can be used on standard windows as well as odd-shaped shutters for arches, angles, ovals, and circle windows. They can also be combined with other window treatments for a custom look to match the style of your home. 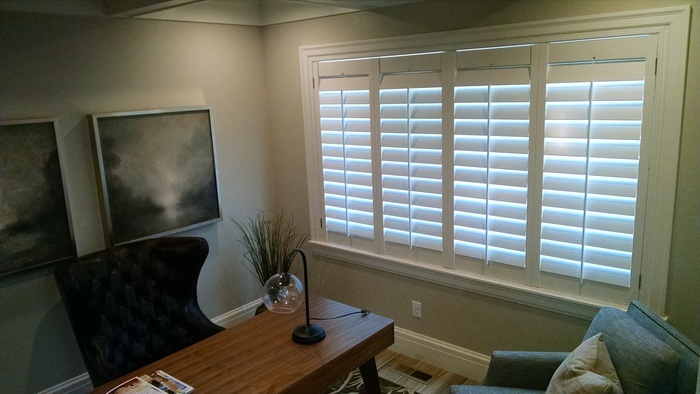 Stanfield Shutter is Utah’s premier interior shutter manufacturer since the 1950s. From standard to custom creations, the Utah family company is dedicated to quality, reliability, reputation, and customer satisfaction. At Stanfield we offer several different styles of custom shutters.